Remember we take things so much harder than they do and they also pick up on our emotions. So try to express “happy” emotions around your blind baby . Ask people to let your dog “smell” their hand before touching them. Most blind dogs personalities don’t change. Some dogs however can easily become “startled” and this could also lead to fear biting in some dogs. Try to treat them as normal as possible. Building their confidence is key to letting them know they can still do things and that you still love them….let them know they are still the same dog in your eyes. For a blind pup it can be the basis for what type of personality they will developed. Coax, encourage and praise them to do the same things they did before. However, understand and still praise them if they “can’t”. Be creative with different scents to mark areas for your blind babies–just make sure its safe for them. You can use different scents of flavored extracts or even something as simple as hanging a car air freshener or potpourri sachet on a door. 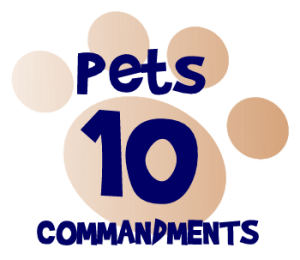 Using different scented candles in each room may also help your dog distinguish from different rooms in your house . Use textured materials to mark areas. Throw rugs and decorative pillows are great (and people don’t even realize their “Real” purpose). Indoor/outdoor carpeting, wind chimes and something as simple as cedar chips or decorative bricks or blocks can help guide them along their way outside. Use bells or jingling tags on your other dogs.. not only help your blind babies to find/follow your other dogs, but will also avoid them from being startled by your other dogs. You can also use bells on your shoes to help them find you. Don’t be afraid to walk with a “heavy foot” when approaching them especially with a blind/deaf baby….they can still feel vibrations. Don’t under estimate the power of touching and massage. Be very vocal with your dog. A tabletop fountain can be used as a water bowl. Get a simple one with a large bowl and the sound of running water helps to orient the blind dog and helps him to find his water bowl as well as know where he is from the sound. Some dogs like drinking from running water too! 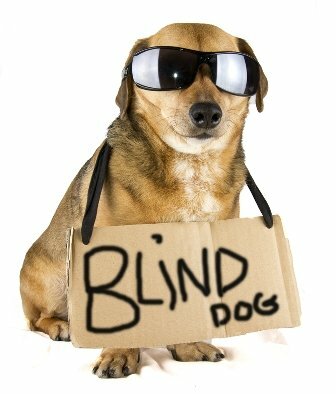 This can be especially helpful if you have to move to a new home with a blind dog.